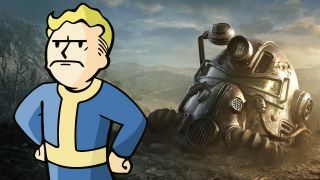 Update: In a post on the Fallout 76 Reddit , Bethesda has announced that it's actively working a hotfix for Patch 5 to address problems like the Bobby Pin weight, Bulk Junk autoscrapping, and a myriad of reintroduced bugs. "It appears that a merge of internal development builds failed to execute properly prior to releasing Patch 5," the post reads. "The team is working to identify how this happened so we can prevent this from repeating in the future." As for when the hotfix will deploy, Bethesda is aiming for "either the end of this week or the beginning of next." Yesterday's Fallout 76 update was a doozy. It heavily nerfed the Demolition Expert, White Knight, and Licensed Plumber perks, along with the Explosive and Two Shot legendary weapon modifiers. It added a few quality-of-life improvements, including increased maximum carry weight, more readily available plans and recipes, and modular Cap stashes, which should help with Cap exploits. Unfortunately, the update also introduced several bugs - some of which have already been fixed once before. Since the update, many, many players have reported that bobby pins are once again untenably heavy, fusion cores are spawning far too rarely, and more concerningly, a recently patched duping method has been reopened. All of these issues were fixed in previous updates, so it's strange to see them abruptly return. Bethesda hasn't officially addressed the returning bugs, but community manager Ladydevann has been active in Reddit posts discussing the ill-fated patch. Ladydevann confirmed "we are talking with the devs on this" in a reply to one user's post about the bobby pins, fusion cores, and duping. In another comment, she said a fix is currently scheduled to arrive later this week or the start of next week. "I know I sound like a broken record," Ladydevann said. "I just want players to know when I've seen their comments rather than ignore them. If a player is frustrated, posting about it and not getting acknowledgement that they're being seen and heard adds to that frustration. I really am trying here." This is the last thing Fallout 76 needed, and it's the last thing Fallout 76 players wanted, so for everyone's sake I hope it's resolved quickly. If you want to read the update's full patch notes - which, ironically, includes a laundry list of bug fixes - you'll find them here. They got nerfed, but Fallout 76 Two Shot Explosive guns are still pretty good. Here's how to get 'em.